The Regional Director of East and Southern Africa at the International Fund for Agricultural Development visited, on 30 January, different projects financed by IFAD in Bubanza province. Beneficiaries appreciate the step made in rural transformation. Sara Mbago Bhunu, Regional Director of the East and Southern Africa at the International Fund for Agricultural Development -IFAD is in Burundi since 28 January. “I really want to have a deep understanding about the IFAD portfolio in Burundi,” she says adding that she has held discussions with international partners, government and other stakeholders involved in the agricultural sector. On 30 January, the Regional Director of East and Southern Africa at IFAD met beneficiaries supported by IFAD in six different projects in Bubanza province. She also met a group of rice farmers in Musenyi zone, in Mpanda commune. About 219 members including 133 women and 87 men grouped into “Twizigirane” cooperative work together to grow rice and easily harvest about 700 tones per agricultural season. “Our objective is to achieve 2000 tones,” says Marie-Louise Baranyikwa, chairwoman of the cooperative. She says their cooperative can easily earn BIF 20 million depending on the market and each member can receive BIF 100,000 after saving in the cooperative. The Regional Director of East and Southern Africa at IFAD has also visited a Nutrition, Learning and Rehabilitation Center – FARN. It was set up on Nyabikere hill in Mpanda commune by PROPA-O. FARN is a meeting place in hill households where cooking demonstrations and sensitization to good nutrition, health and hygiene are conducted. About 200 people have benefited from the building capacity when 30 children were screened for malnutrition on Nyabikere hill. She also met breeders, transformers of food in Musigati commune of Bubanza province before attending the trade fair of products supported by IFAD. Sara Mbago Bhunu has appreciated the step made in the agricultural sector. She says it is encouraging and calls for the participation of the private sector. “The private sector should contribute to rural transformation. Beneficiaries need to increase their revenues in order to overcome poverty,” he says. The Regional Director of East and Southern Africa says IFAD has three priorities for the three next years. She, first, says there is a need to cope with climate change. She adds that local communities should be equipped with tools that would help them deal with droughts and floods. The second priority, according to her, is to build capacity for local food processing. “The other added value is to produce local products and have access to markets in local shops”, she says adding that the third priority will focus on the youth. “IFAD portfolio in Burundi is really trying to engage youths in businesses and include them in our projects,” she says. Emmanuel Ndoricimpa, Permanent Secretary at the Ministry of Environment, Agriculture and Livestock, says the ministry has decided to closely follow the activities undertaken on the field. “We are accustomed to seeing “project-billboard” where after the project execution, beneficiaries are left on their own,” he says. The ministry of agriculture and the local administration will closely follow the projects carried out in different areas of the country, he adds. 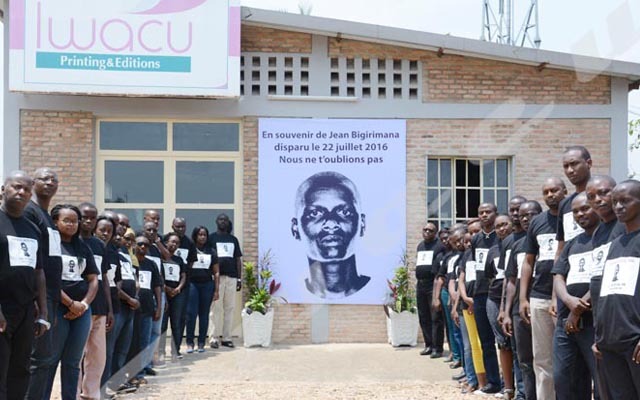 IFAD has been supporting Burundi since 1980. Its program in the country includes 7 ongoing projects worth $ 414.56 million including $ 189.02 million in IFAD grants (46%) targeting 1,572,000 direct beneficiaries.